“Stacy-When you start your training program do you know ahead of time all the cues will be used and then build, build build during training so your horse learns the cues? Do you adjust the cues as training progress dependent on how your horse is working with the queues? Do you use hand cues; I see a lot of hand and mane work, is this to make Roxy comfortable or where there cues in that motion? Are you talking to Roxy during the show? It looks like you are. 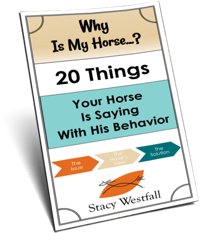 Do you talk to your horses outlound for help and encouragement? Q-When you start your training program do you know ahead of time all the cues will be used and then build, build build during training so your horse learns the cues? A-I use all the same cues. 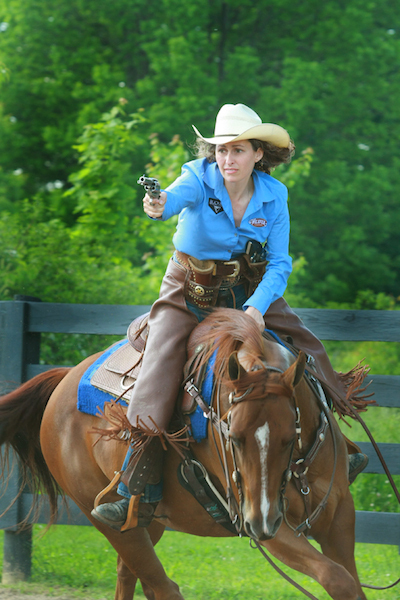 They can be modified, for example, when I am mounted shooting I don’t want them as ‘sucked back’ as I do if I am getting ready to show bridleless. The foundation is the same-the horse still has all the same cues, I just use them slightly different. Q-Do you adjust the cues as training progress dependent on how your horse is working with the queues? A- I change the cues depending on what I want to do with the horse. They all need to be competent in the cues. Q-Do you use hand cues; I see a lot of hand and mane work, is this to make Roxy comfortable or where there cues in that motion? Q-Are you talking to Roxy during the show? It looks like you are. Do you talk to your horses outlound for help and encouragement? A- I was singing along with the song (lol) to keep my timing, lip-syncing actually. The only voice cues were; kiss to lope, cluck to run faster, kiss to roll-back, whoa to stop. My horses are so cued into my body I don’t use verbal beyond what I mentioned. At home, being silly, I will a little for the benefit of my kids, etc who are around. 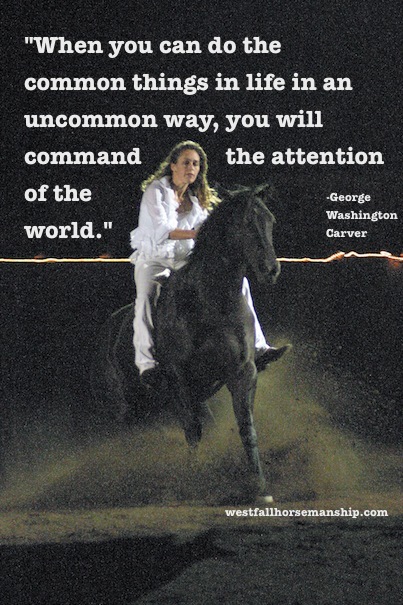 Between me and the horse we are mostly non-verbal…it is a beautiful thing! 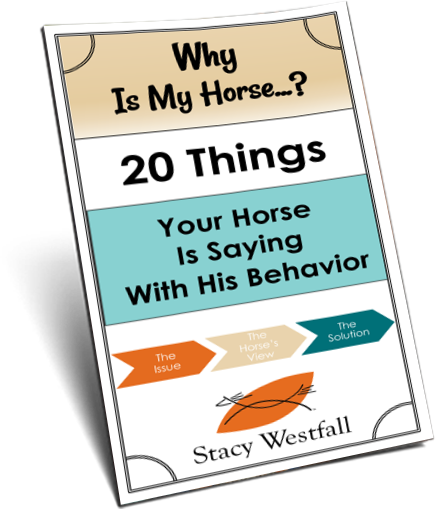 ← Stacy Westfall, Why can I see your legs bumping when you ride your horse? Wow your training has amazed me…. i want to train your method……… i hope i can be this connected to my foal… what would u suggest to be doing with her at this age?? She is 6 months old…. and soooo layed back…. . Also how often?? Have you ever started/trained a deaf horse? I have a 2 yr stud colt I will be starting this spring, and though I ‘figure’ things will still be mostly the same, I wonder about kissing/clucking and the initial saying ‘whoa’ in my training. I can’t find any information about how trainers have altered, or not, their methods with deaf horse training. Thanks! Suzi- There is a bloodline in the reiners that are known to be deaf a large part of the time. They train about the same, minus the voice cues. They have won a lot! Stacy thank you for all the answers. It’s really interesting to learn what is really going on when I watch your videos. It looks like magic! Stacy… I have a few more questions….. and I know you are limited with your internet/data….so hopefully you are at the starbucks or library when you see this….lol… but seriously….. I have watched several videos with you talking about “stall movement” and “whipping with the stick and string”……my question is … did you do this with JAC??? Lesia- I AM AT STARBUCKS! lol…really, I am. So far I have had a Grande Peppermint Mocha (soy), uploaded Jac-Episode 30, and tried my first Carmel Macchiato…decaf this time. My last Starbucks-double drink day- kept me up all night! I did do the stall stuff with Jac. We tried to video it but the angle came out terrible so we couldn’t use the footage. Live and learn. I don’t think the whipping with the stick and string make the cut on the Youtube because he didn’t have much of a reaction. It is on the DVD bonus footage but yes, I do all of that with all of my horses. HAHA…this tickled me……. I believe you!!! ….. cant wait to watch the “bonus” videos…..thanx! !